After warning fellow Republicans not to drink the “Trump Kool-Aid” during the primary season, former New Hampshire Gov. John Sununu has endorsed Donald Trump. The former governor’s Sept. 27 endorsement is the latest in a string of high-profile Republicans who have reversed their opposition to Trump over the past week. Sununu, who served as White House chief of staff under President George H.W. Bush, said Trump is the only candidate who can “bring bold change” to Washington. Texas Senator and former presidential hopeful Ted Cruz announced in a lengthy Facebook post on Sept. 23 that he had decided to back Trump, citing the pledge he signed during the primary and his opposition to Hillary Clinton as the reasons. 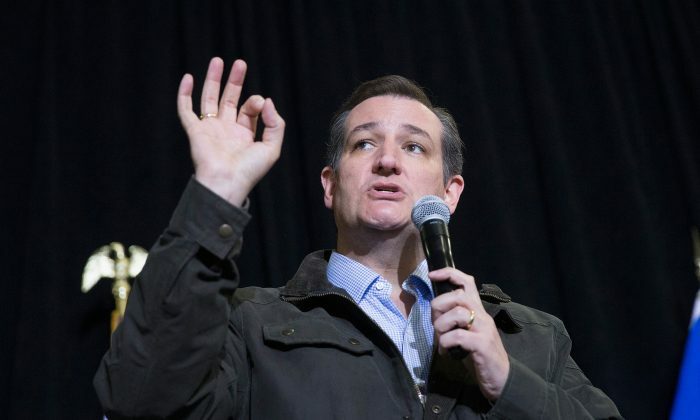 “After many months of careful consideration, of prayer and searching my own conscience, I have decided that on Election Day, I will vote for the Republican nominee, Donald Trump,” Cruz said. Cruz’s challenge to Trump in the primaries was the most enduring and most personal. He also refused to endorse the businessman at the Republican National Convention, telling voters to “vote with their conscience,” eliciting boos from the pro-Trump crowd. The “vote your conscience” rallying cry was used as a last attempt to stop Trump from getting the nomination in the days leading up to the convention, but it failed to gain enough traction to effectively stop the nominating process. Kendal Unruh, a GOP Colorado delegate, used the slogan to co-found the group “Vote Conscience”—formerly “Free the Delegates”—and was one of the Colorado delegates that walked out in protest when Trump was formally nominated at the convention. Cruz is not my conscience. I will still be voting my conscience. The shift towards the GOP nominee by the anti-Trump movement has been brewing since Trump secured the nomination in May. Another high-profile reversal came when Joe and Marlene Ricketts announced on Sept. 20 they were donating $1 million to a pro-Trump super PAC (political action committee). The billionaire family, which owns a majority stake in the Chicago Cubs, gave at least $5.5 million in combined donations to Our Principles PAC, a committee that’s anti-Trump, during the primaries. Their son Nebraska Gov. Pete Ricketts broke with his family’s opposition earlier this year when he endorsed Trump in May several days after Cruz dropped out of the race. House Speaker Paul Ryan (R-Wis.) and House Majority Leader Mitch McConnell (R-Ky.) made similar reversals earlier this year. Other prominent Republicans who continue to oppose the Republican nominee include former presidential candidate Mitt Romney, Ohio Gov. John Kasich, Sen. Lindsey Graham (R-S.C.), Sen. Ben Sasse (R-Neb. ), and Sen. Jeff Flake (R-Ariz.).